As the first and greatest incarnation of Outer Mongolia, Zanabazar was the subject of many portraits in media ranging from the humble woodblock print to sumptuous gilt bronze (see also cat. no. 16). 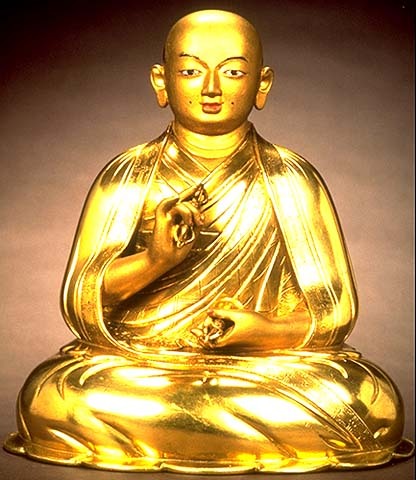 This gilt bronze image of him is one of several major representations still surviving in Ulaanbaatar (others are in the Bogdo Khan Palace Museum, see Rossabi, "Mongolia: From Chinggis Khan to Independence, fig. 9, and at Gandantegchinlin), and a mold to make a smaller scale, but identical sculpture of him (cat. no. 114) suggests that his image was widely proliferated. Though intended to be seen only from the front and then only when clothed in a Tibetan-style nab-sa (mantle), Zanabazar's back is beautifully sculpted into a fan of regular, rounded folds. He presently sits ensconced on a square dais, backed by an aureole decorated with a pair of upswept crocodilian makara. Zanabazar's flat cushion and back rest are like the stacks of pillows high lamas sit on while presiding over religious ceremonies, suggesting that this portrait of him was taken from life. (in fact, both this figure and other similar ones have been called self-portraits, probably mistakenly.) Aleksei Pozdneyev writes, however, that the first portrait of Zanabazar was not made until 1798, when the Fourth Bogdo Gegen visited Amarbayasgalant Monastery, which had been built by the Yongzheng emperor (r. 1723-35) specifically to house Zanabazar's remains. There the Fourth Bogdo Gegen had the suburgan (reliquary) housing his predecessor's embalmed body opened and ordered his best artists to paint a portrait of the corpse. This portrai<9#okesh Chandra, Buddhist Iconography, especially nos. 1192 ff. 3. See, e.g., Robert Thurman and Marylin Rhie, Wisom and Compassion, cat. no. 91, p. 255. 4. Ibid, cat. nos. 88, 89, 98, 100. 5. Charles Bawden, The Jebtsundamba Khutukhtus of Urga, p. 52. 6. Aleksei Pozdneyev, Mongolia and the Mongols, p. 355.